My Review: I LOVE THIS BOOK! It was after 8 pm when we got home from all my kids activities and there was the package at the front door! Not knowing exactly what was inside, I opened it and couldn't believe my eyes.....National Geographic Book of Animal Poetry arrived already! I sat the book on the counter and ordered the kids to put on pjs and brush their teeth. The next thing I know, it is 9:30 pm and we are all on the couch having just finished the book....still in our practice clothes and no teeth brushed. 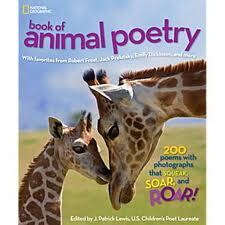 We all LOVE the National Geographic Book of Animal Poetry. The photographs in National Geographic Book of Animal Poetry are AMAZING. They are down right gorgeous. That is something you can always count on with National Geographic. The poems are too cool. As an added bonus, in the back of the book, is a description of the different types of poems (Couplet, Shape poem, Haiku, Limerick and Free Verse). I loved that it ties what my kids have learned in school to such a cool book. My kids fought over who got to take the book to school first. They couldn't wait to share it with their teachers and classmates. I took it into work and shared it with several co-workers. Everyone LOVED it. Seriously....National Geographic Book of Animal Poetry is fantastic. Turtles sit. Turtles wait. Turtles never think they're late. Turtles crawl. Turtles snap. Turtles take a long, long nap. Turtles listen. Turtles hide. Turtles like to stay inside. Purchase It: You can buy National Geographic Book of Animal Poetry online at Amazon for $24.95 (Prime members $16.47), Barnes & Noble for $19.19, and IndieBound for $28.90.